A team of scientists in China has become the first to treat a human patient with the groundbreaking CRISPR-Cas9 gene-editing technique. While the results of the trial are uncertain, it’s a historic milestone that should serve as a serious wakeup call to the rest of the world. A research team led by oncologist Lu You at Sichuan University delivered modified immune cells into a patient suffering from an aggressive form of lung cancer. 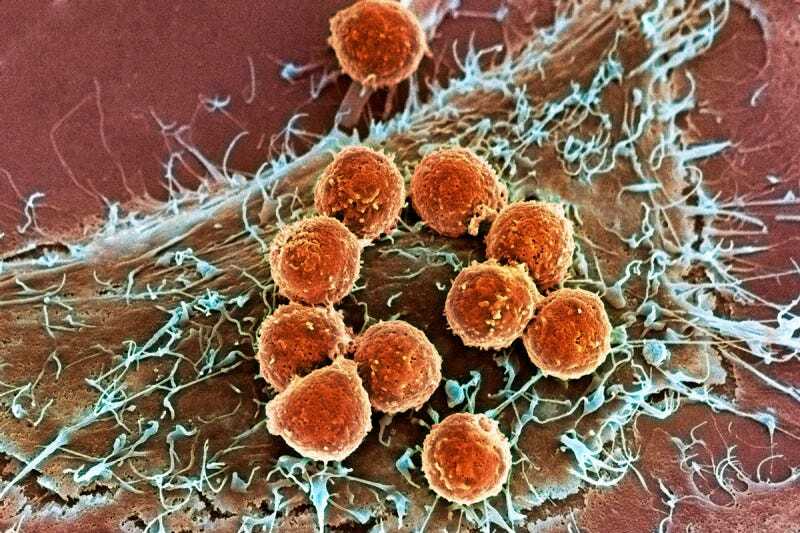 The scientists used CRISPR-Cas9 to make the cells more resilient in the presence of cancer, marking the first time that the powerful gene-editing tool was used to treat a human. The study was limited to one patient in order to test the safety of CRISPR. Given the encouraging results, another 10 patients will be treated as part of an ongoing clinical trial being conducted at the West China Hospital in Chengdu. To treat the patient with metastatic lung cancer, Lu’s team removed immune cells from his blood, and then “knocked-out” a gene using CRISPR-cas9. The unwanted gene codes for a protein that interrupts a cell’s immune response—a genetic quirk that cancer exploits to spread itself even further. The modified cells were then cultured to create a large batch, and injected back into the patient. It’s hoped that the edited cells will attack and defeat the cancer, and Lu says the initial treatment went well. The US is a bit behind China in this area, reflecting the contrast between China’s unwavering enthusiasm for biotechnology and America’s trepidation when it comes to such work. In 2015, a different team in China became the first to genetically modify a human embryo using CRISPR. Scientists and bioethicists in the United States took notice, approving a number of baby-step guidelines that should put America on a similar path. The latest breakthrough by Lu and his team will likely motivate similar efforts in the US and elsewhere. And indeed, there are already plans in the US to start clinical trials using CRISPR to treat bladder, prostate, and renal-cell cancers, though none of these trials have been approved, nor do they have adequate funding.